Tune into Radio Carly: How I cope with Ichthyosis and working full time. 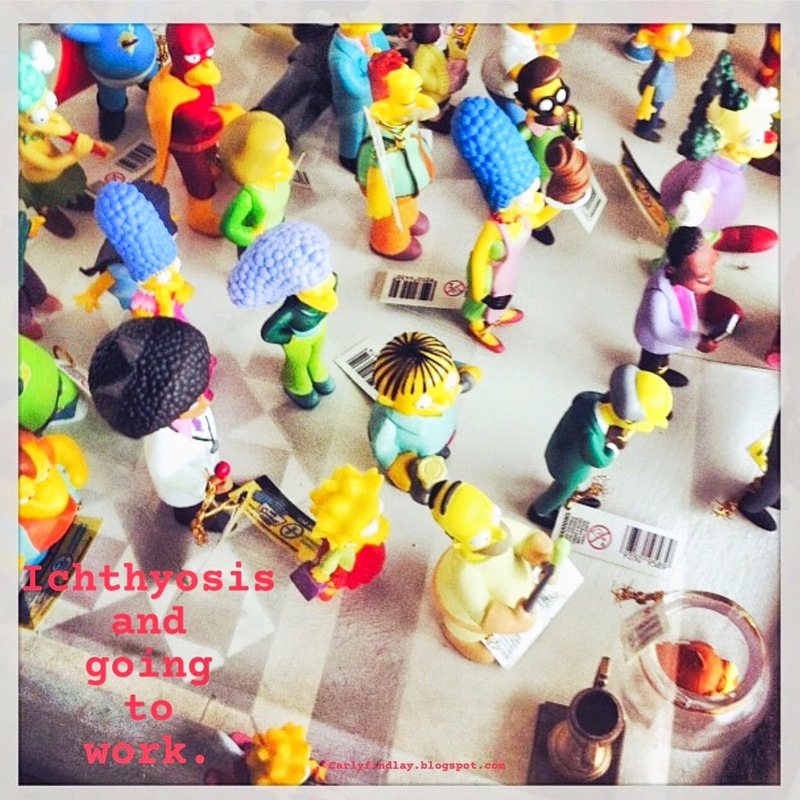 A few people with Ichthyosis and disabilities have asked me how I maintain a full time job and how I talk to my managers about my condition. So here's my employment story. I've been sore for the past six weeks or so. I have been in hospital, had a full week off and days off here and there. Every morning when I wake up, my skin is in pain. It exacerbates in the shower and through the day it gets tighter on my legs, and weeps. One afternoon recently I was feeling extremely sore and told my manager that I was sore and I'd leave a little early to rest, and asked if I could take my time starting work the following day. I don't want to speak to soon but I had a half hour sleep in the next morning and didn't rush for work. I felt one thousand times better and less sore than I have done any morning (or day) these past six weeks. Here's to rest and a supportive workplace! Sometimes I feel I have to prove I am not just a red face. I have to prove that I can work hard, that I am smart and educated. I am very outspoken and don’t let my appearance hold me back. I am also mindful of the perceptions of having an illness that appears the same to my colleagues every day. While my face might be the same level of redness each day, my level of pain differs from one day to the next. I might be smiling but I'm in pain. I might have been well yesterday but it's hard to walk today. I worry about the perception of sick leave – what if I feel fine one night when I see a band but wake up the next morning with awful painful infection (due to no fault of my own)? What will my colleagues that don’t know me so well think? It's hard. I work as a public servant - I have done for 11 years. I have chosen this employer for many reasons including the leave conditions and diversity policy which is accommodating to my condition. I don't have any physical workplace modifications as such - except I do get a new keyboard and mouse regularly because of the germs - but I do have modifications that involve understanding and flexibility - that goes too ways. When I'm at work I put in 110%. When I'm not able to, my workplace understands. Once I found a role that suited my interests and skills - and a bonus to have amazing managers - my health improved so much. There's a saying that if you enjoy your work you'll never feel like you're working. And my career has been that way for years now, give or take a few months. One of the best things I have learned in my career is to be upfront about my disability. I've told my managers and colleagues what it means for me. I have also talked about my limitations and (most importantly) my strengths. I have told them that there are hospital appointments I have to attend. There will also be days where I am not well enough to come to work. They understand that. I have made a decision to be really open about my condition and needs. I acknowledge that disclosure is optional but in my experience, disclosing my Ichthyosis (there's no choice not to!) has helped. When I get a new manager, I talk to them about my skin, what it means for me and what it means for them as a manager. I've given them medical and anecdotal evidence about my condition and invited any questions. I also let them and the team know when I'm leaving for hospital appointments. Regular hospital appointments (bi-monthly) are generally scheduled first thing in the morning or towards the end of the day so I can go there straight from home or from work. I only take sick leave when I'm sick - because I can't afford to waste it. For many years now my sick leave used to run out and I'd use annual leave or purchased leave when I'm sick. The supportive workplace and enjoyable and suitable work has meant that I'm able to roll over my sick leave. Yay! I've also become involved with diversity and disability initiatives in my workplace. Freelance writing and speaking is work too. And I feel super busy - always. I come home from my day job and work. If I'm not well enough I say no. If I can't make a deadline outside my day job I say no. I hope editors and blogging partners understand. I'm also mindful not to be perceived to be doing other work while I'm on sick leave from my day job. My own values dictate that I'm always seen to be doing the right thing when it comes to my day job - after all they pay me so I can do all the other fun stuff. I will do a little social media for myself at home, but generally I don't blog about big issues or write or speak for others when I'm unwell. Lately I've been organised enough to have a heap of posts batch-written and guest posts to go. So the pressure to produce blog content has subsided a little. I've been careful to balance my day job with my freelance work, advising the media department of any publications I feature in, talking to my manager about my goals inside and outside my day job and also talking through situations where there may be a conflict of interest. I've familiarised myself with social media policies and public comment policies - and am mindful of these in everything I do. However I still have a voice - most recently attending a protest to save ABC Ramp Up - I was I interviewed on the news but made careful decisions about what I answered in relation to the protest and the importance of disability media and also government policies. It can be tricky. I need to be careful what I write about here - but there has been times when I've felt very uncomfortable with peoples' reactions when they meet me. For quite some time I was 'the face' of my building, in a very internally public role. I never had overt reactions, but living with a facial difference for my whole life has meant I'm good at reading expressions and recoiling body language. I always go to shake peoples' hands and look them in the eye and haven't been afraid of leading a discussion or speaking in front of a workplace audience. One woman told me she couldn’t handle looking like me, but I laughed that one off and turned the example around and used it in a skit in my community TV work. The times I have felt uncomfortable have been met with wonderful support from managers and peers after I've spoken up. As I said earlier, I'm fortunate to work somewhere with a diversity policy. I make lists, schedule hospital appointments in my calendar and try to prepare food for the week on a Sunday. I am a big believer in eating well to be kind to my skin, boost immune system and maintain energy so I take home made lunches to work - so I know what I'm eating. The slow cooker gets a lot of use in winter! Changing Faces' What Success Looks Like initiative has got some great resources about talking to your employer about your facial difference - which can apply for all types of disabilities I think. It also has some tips for employers when interviewing and working with people with facial differences. I'd like to acknowledge just how hard it can for people with disabilities and chronic illnesses to get into the workforce. The physical and attitudinal barriers are astoundingly disappointing and there's a distinct lack of opportunity. There is still bigotry and fear around disability. I really hope the barriers to employment are lifted in my lifetime.